CHARLES CITY — Run or walk June 10 to help homeless pets in the Charles City area. 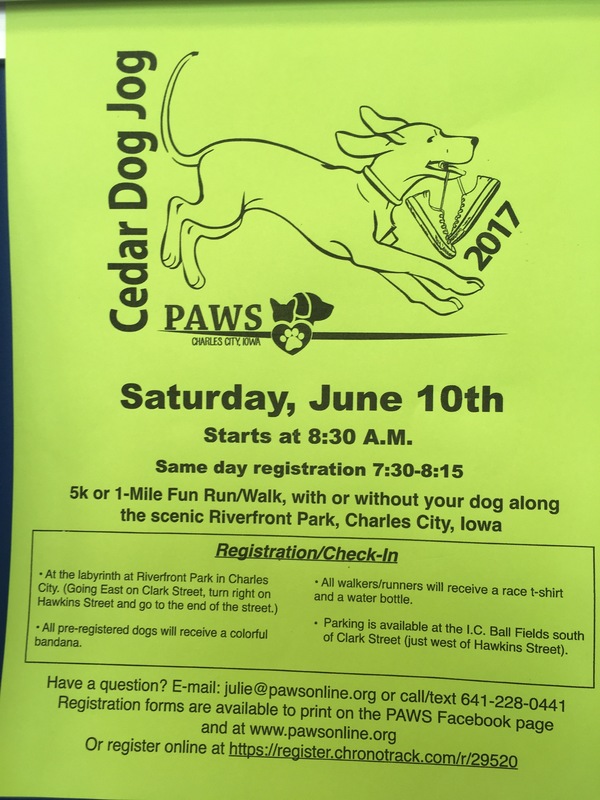 The annual PAWS Cedar Dog Jog returns at 8:30 a.m. Saturday, June 10. According to the registration website, the price to run or walk the 5K route that begins in Riverside Park is $30 for an adult and $20 for children 15 years old or younger. A family rate of $45 is also available. These rates include a T-shirt. Participants can get a discounted price of $10 per adult and $5 per child if they decide to not get a T-shirt. This fundraiser benefits the PAWS Humane Society animal shelter in Charles City. There will be same day registration from 7:30-8:15 a.m. Parking will be available at the I.C. Ballfields south of Clark Street. All dogs on must be on at least a 6 ft leash, be friendly and be up to date with their rabies shots. This entry was posted in Calendar, Charles City and tagged Charles City, PAWS. Bookmark the permalink.